This is a Hawaii County Civil Defense Winter Storm update message for 7:30 p.m., February 10, 2019. Hawaii Electric Light is advising customers to be prepared for extended periods of power disruption due to hazardous weather conditions. Crews will continue with power restoration efforts when it is safe to do so. If you have a life-threatening emergency call 911 for medical, fire or police assistance. 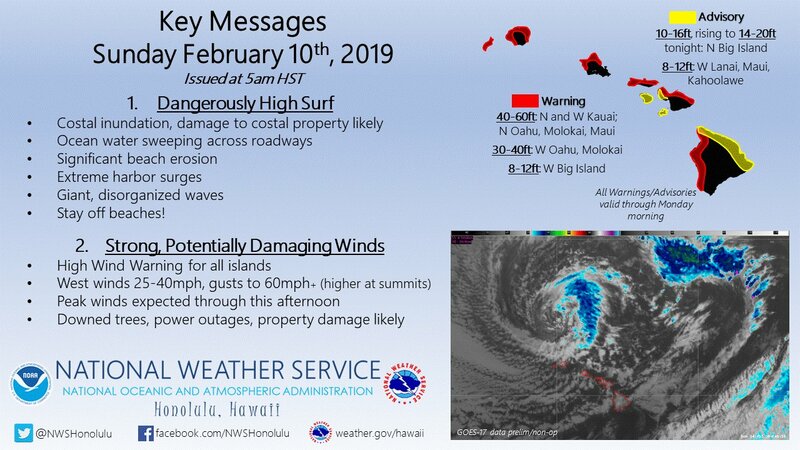 This is a Hawaii County Civil Defense Winter Storm update message for 5 p.m., February 10, 2019. The National Weather Service has issued a High Wind and High Surf Warning for the Big Island. The onset of the winds and waves have begun in some areas. All persons are advised that the peak period for this storm and impacts are forecast for later tonight into Monday morning for the Big Island. Oceanfront residents should be prepared for wave run-up due to large surf. Hawaii Electric Light is asking Hawaii Island customers to conserve electricity between 6-8 p.m.
Department of Water Supply has issued a water restriction for North Kohala from Hawi to Makapala. Due to the power outages of these wells, the Department of Water Supply has no power. Residents are asked to limit water use to drinking and health purposes only until power is restored. Waipio Valley, Laupahoehoe Road, and South Point Road are closed and open to residents only. 8:40 a.m., Sunday, February 10, 2019. The access road to the summit of Maunakea is closed to the public at the Visitor Information Station at the 9,200 feet level due to below freezing temperatures and high winds in excess of 110 mph, gusting to over 140 mph. The National Weather Service has issued a High Wind Warning for Hawaii Island summits until 6 p.m. Monday. Rangers will continue to monitor road and weather conditions and this message will be updated accordingly.